The first time they arrived it was amazing to see them fall from thousands of feet up in the air. Slowly but surely a little colorful speck would appear between the fluffy clouds amongst the light blue skies. 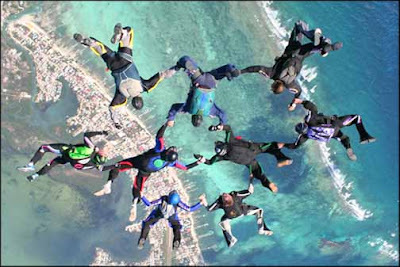 You always have a choice: Watch the skydivers in their element, or join them in a sky dive! 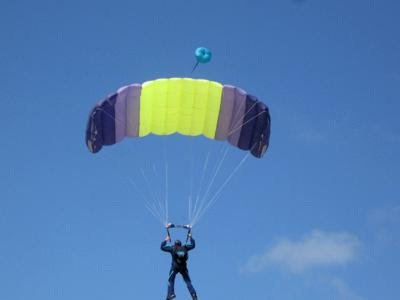 The skydivers had arrived in San Pedro. Year after year, local residents and tourists alike rendezvoused to the drop point located at Tres Cocos. There at that location, they would land, amongst cheers and applause. For years they had arrived but an interview, this year, with Richard Grimm of Tsunami Skydivers Inc. revealed the possibility that Boogie in Belize might not see another year. February 20th - March 1st, 2010. The skydivers are coming back for more!